Learn more about the AEMC 2121.40 1950 camera with pricing information, features, and frequently asked questions. The AMEC 2121.40 1950 camera is an infrared thermal camera. The camera is equipped with technology that can sense hot and cold air coming from machines, even while they are running. The AEMC 2121.40 1950 can be used for industrial safety inspections. Quick and easy setup via user interface. Pros: Link to other devices with Bluetooth. Starts up in under 3 seconds. 13-hour battery life. Cons: Expensive. Small LCD screen. 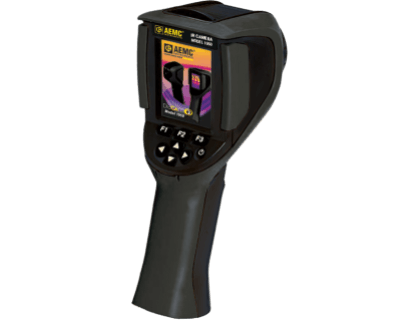 Bottomline: The AEMC 2121.40 1950 is a great choice for thermal imaging if you need to diagnose problems quickly and without shutting down equipment. The AEMC 2121.40 1950 thermal camera costs $1,420.25. How long does the AEMC 2121.40 1950 battery last? The rechargeable battery has a 13-hour life, at which point you can plug it in to recharge it. What is the AEMC 2121.40 1950 used for? How many images can be stored on the device? The AEMC 2121.40 1950 comes with a 2GB SD card that can store approximately 4,000 images. You can switch out the 2GB card for a larger SD card, all of the way up to 32GB. What are some AEMC 2121.40 1950 alternatives?